My Santos doll – completed! I finished her!!! My first Santos doll! A few months ago I signed up for Jennifer Rizzo’s class to learn to make Santos Dolls. Prior to this I hadn’t heard much about Santos Dolls, but I had seen a few here and there in antique shops and around the web. I am intrigued by them. When I saw the class advertised, I couldn’t wait to sign up and learn how to make them myself. It took me a little bit to gather the supplies… the craft stores that I go to (Michaels and Craft Warehouse) did not have the three main ingredients… paper mache eggs, paper mache mannequin, or paperclay. It took some searching online to find the eggs and the right size mannequins. I was really surprised at that. Creative Paperclay was readily available online. When I finally found them, I accidently ordered 24 eggs, heeheehee! Jennifer did a really good job of walking us through sculpting the face. She went step-by-step and broke down each part of the face into it’s very simplest form. Even though my face is a ‘bit’ off, I felt successful because it is actually a face and not some weirdly deformed mass of clay. Through this class I also found the courage to experiment with mixing my acrylic paints to create the exact color I wanted for skin tones and the dress. Speaking of the dress, the first layer is book pages and the second layer is 7 Gypsies tissue paper. They I made a glaze of the dress color to go over it. I’ll be trying the cage design next. The necklace features a piece from my molton lava stash. More about that here. I felt the little cross was perfect in size and concept given the religious connotation of the doll. Now that she is finished, I’ve brought her out of my studio. She looks lovely in my living room. I am excited to start the next doll. Perhaps I’ll create a series – designed around the major holidays or seasons. Just like every other craft hoarder out there, I have tons of stuff that I’ve never used… like these stamps, and ribbon, and spinner. There’s a lot of craft stuff stored here and there that I haven’t used. And I always feel so good when I break something out of it’s package for the first time and do something with it! The stamp set that I used is called Take a Spin from Stampin’ Up! I pulled out my markers and colored each of the sections a different color (Blushing Bride, Soft Suede, Pear Pizzazz, Pool Party) to coordinate with the cardstock. Most everything I used is a Stampin’ Up! product unless specified. I used a set of Spellbinders for the stamped piece and the Pool Party cardstock underneath it. I ran a piece of Blushing Bride cardstock through a Swiss dot embossing folder and swiped it with white pigment ink. The crocheted pink ribbon is from the stash of goodies I received from Melissa Frances last April. I used some softly colored paper scraps and the Mini Royal Rose die from My Favorite Things for the roses. They looks so sweet on this card and make a great accent. The leaves were made using the Little Leaves Sizzlit. This is the inside of the card… and this is exactly how it looked when I gave it to her. Yeah, because I FORGOT to write something inside and sign it. And since I put it in the cool little clear box and enclosed it with a fab little belly wrap, I couldn’t just rip it open and write something at the last minute. Luckily she knows just how wonderful I think she is! Little Charlotte is working on developing her artistic talents too. We stationed her at the picnic table with some acrylic paint and a canvas. She was very focused and had the best time creating her masterpiece. Oh, and she did get a smidge on the canvas too, heeheehee! Summer’s ended and the rains have begun. It went by too fast!!! Are you looking forward to fall or lamenting summer’s end? Or maybe both? Truly, I was really busy. My daughter, Em, decided to have a BBQ at our house for Charlotte’s second birthday. No problem, except that our backyard was not worthy of guests. Since we live in a rental house (in a super crappy neighborhood) I never feel like spending any money making improvements. Em and I are always talking about moving and one day, when I have some extra cash, we ARE going to move! Ok, back to the party… we did so much yard work. I bought a ton of flowers and planters and soil and trellises. So many trips to the store. Not only that but we bought a picnic table that we put together and Em stained. Em bought a cute playhouse for Charlotte that we put together. And we bought some patio furniture. I haven’t had a decent backyard in quite a long time. The party was a success except for the cupcakes. Never, ever, try to make buttercream frosting in 95 degree weather. No fluff, just melty gooeyness. yeah. Now we can talk about the tag. Take a look at Tim Holtz’s blog for June to see the techniques. He used Distress Markers to create a watercolor effect. It’s really easy to blend the Distress Markers on watercolor paper with a pain brush or aqua brush. I really need to get more of those markers because I only have five (Peeled Paint, Barn Door, Tumbled Glass, Frayed Burlap, and Picket Fence). The Picket Fence marker is great for highlighting. I used the key from the Industrial Blueprint stamp set and stamped it with Black Archival ink on watercolor paper. For the background I used the Vintage Photo Distress Ink pad, Peeled Paint Distress Stain, and Wild Honey Distress Paint. The stamp is from the Way With Words stamp set. The tag is one that I found on a piece of clothing. I flipped it over and used some words from the Tim’s Chit Chat book. The ribbon is black grosgrain. 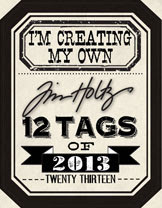 Here is the second tag that I made… I used the On the Grow stamp set from Stampin’ Up! I really enjoyed coloring the flowers. So pretty! I swiped the tag through Tumbled Glass stain, Spun Sugar paint, and Frayed Burlap ink. I wanted a lot of texture on this background so I lightly stamped on a piece of tissue paper, crumpled it up and glued it to the tag. Then I went over it with a very light application of ink. I added Glossy Accents on the bottle to make it shiny. Ribbons are from Stampin’ Up! and the pearls are from my stash. There are so many great markers out there. What markers do you normally use? Moving on… Tim Holtz’s July techniques this time revolved around Rock Candy Crackle Paint and using a brayer to create the background. As usual I used watercolor paper for my tag. I really like the texture and how well it works with the distress products. I used Squeezed Lemonade and Frayed Burlap Distress Stains and a brayer for the background. Then I stamped over it using black Archival Ink and the Attic Treasures stamp set. To keep the images light I stamped off on scrap paper before I stamped on the tag. The edges are distressed with Walnut Stain Distress Ink pad and applicator and roughed up with a distressing tool. A couple of pieces of tissue tape add to the sewing theme. I dyed two Stampin’ Up! ribbons using Distress Stains and then I stamped on the yellow ribbon. Now it looks like a measuring tape! The little tag was made using the Tiny Tags stamp set and punch from Stampin’ Up! I pinned it on with a mini safety pin. I stamped and cut out the flag and embellished it with a button brad and two more small buttons. I also used a little distress ink on it. “be” are rub-on letters that I’ve had forever – Making Memories. The main focus of the tag is the dress form from Maya Road. First I swiped it with a Tattered Rose Distress Ink pad. After it dried I put on a pretty thick layer of Rock Candy Crackle Paint. That took a while to fully dry and crack up. Then I blobbed some Broken China and Walnut Stain Distress Stains on it here and there letting it soak in really good into the cracks. The stand and knob on the top is where I used Tarnished Brass. You can barely tell that I dyed the checkered ribbon with Broken China. It’s more apparent in real life. I used a piece of scrap fabric for the skirt. The spool is a Maya Road chipboard product as well. I wiped it with my Frayed Burlap Distress Ink pad before adding the Rock Candy Crackle Paint. I used Picket Fence over the crackle. It gave it a cool milky finish. I wrapped it with the same ribbon as the dress form and added a pretty little pin. So that’s it for me. I love checking out everyone’s tags!